We’re in the final stretch. Another school year come and (almost) gone. Huge sigh of relief for parents of anxious kids. For many kids, worries shrink as summer approaches. Days are long and languid and full of home. Nights end with an exhausted collapse into bed. Tangled limbs. Deep sleep. But when September hits – Bam! – right back to tearful nights, fretful days, stomach aches. Go to school. Make your child’s school a frequent destination. Walk there to play on the playground. Bike there for twilight picnics. Take a drive over for an outdoor scavenger hunt or a game of catch. Frequenting the school’s grounds keeps school familiar to your child. Playing there broadens the associations in your child’s mind, linking school with fun and silliness and adventure and you. It is a mistake, especially for anxious kids, to leave school in mid-June and not return until the end of August. So go often. Arrange exchanges there if you can (your child arrives with you, leaves with a friend’s parent). Keep school a familiar place. Use your house. Children who have trouble separating from parents at school often have trouble separating at home, too. Use summer as a time to help your child learn to fully navigate your house alone, providing practice with mini-separations. For children unable to go upstairs alone, set up a series of daily challenges. Have your child go upstairs alone to hunt for an object you have hidden or to accomplish a wacky task – touch every doorknob, turn around 6 times, roll across your bedroom floor, come back down. Do this sort of thing repeatedly – up, down, up, down – gradually increasing the length of time your child is away from you: go upstairs, sit on your bed, draw a hippo eating a popsicle, read a chapter from your book, come back down. For children who keep track of their parents in the house, calling out to reassure themselves you haven’t vanished, institute alone time. Alone time happens with your child in a room alone. No calling out. No coming to find you. Start with a tiny amount of time (2 minutes is plenty for some children) and work your way up to 20 minutes. Help your child brainstorm what to do during alone time, choosing from the toys/activities readily available – but no electronics. If your child calls to you or comes searching for you (and yes, the sudden need to get a drink, go to the bathroom, ask how to spell "octopus" all constitute searching for you), the time starts over. Navigation practice and alone time help children learn to manage the uncertainty they feel when separated from a parent, ultimately easing the transition back to school. 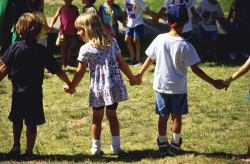 If your child isn’t going to camp or daycare, create opportunities to practice separations. Work out a play-date exchange with neighborhood parents. Hire a teenage sitter. Find free library or other programs with a drop-off feature. Children who have been with their parents all summer long typically have the hardest time saying goodbye at school. Practice. Take on challenges. Help your child define a challenge or two to take on over the summer. Maybe it will be riding a bike with a friend. Or staying at swim lessons while you run errands. Or doing a sleep-over for the first time. Whatever it is, have your child articulate the goal and work together to define a set of logical steps. 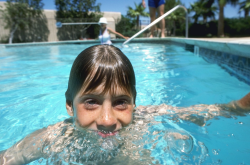 With the swim lesson goal you might stay the first time, go to the car and come right back the second time, go to the car and stay there for 5 minutes the third time, go to the car for the entire lesson the fourth time, take a walk (away from the swim facility) the fifth time, etc. 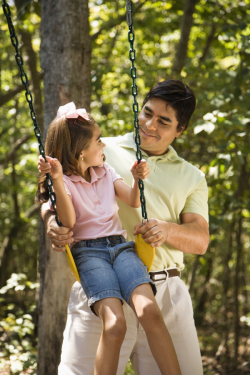 Like alone practice, summer challenges help your child develop the skills necessary to manage uncertainty, overcome fear and rely on other adults, all useful when September rolls around. Talk it up. Talk about school all through the summer. Reminisce about the prior year. Speculate about the year to come. Spread purchases throughout the summer (oh, these socks will be great for school!) rather than waiting and doing it in one fell swoop. Many children (and parents) put school out of their minds for the summer, bringing it up with a groan a week or two before the new school year. Keeping school an active (and positive) topic – as well as a destination – eases the transition in September.